Live action role-playing and verisimilitude make Of Dice and Men a success. 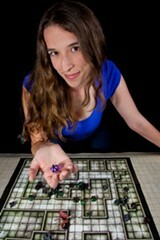 Maria Giere Marquis as a hot gamer chick. People who didn't spend high school wearing a cape, attending LARPer tournaments, or memorizing archaic war terms will still get the gist of Cameron McNary's new play, Of Dice and Men. But it certainly helps if you've played Dungeons & Dragons at least once, if only because you'll appreciate the playwright's attention to detail: The polygonal dice; the obsessive cataloging of "attributes"; the Dungeon Master who has a mid-life crisis at age thirty, after realizing that he still lives in his parents' basement. That master is played by actor Seth Thygesen in Impact Theatre's regional premiere of the play, which also features the comic talents of Jai Sahai and Maria Giere Marquis. How it relates to Of Mice and Men is never quite established, aside from the theme of male friendship and a character getting sacrificed at the end. But it's still brilliant, both in the way that McNary and director Melissa Hillman depict Dungeons & Dragons as a subculture, and in the way they align it to themes of war, power, obsession, and relationships. In his role as Dungeon Master John Francis, Thygesen is the play's narrator and improbable moral compass — "improbable," because he's usually cast in douchebag roles. Here, he's barely recognizable: geek glasses, five o'clock shadow, one hand clutching a baggy full of dice. He's in a room decorated with Star Wars, Avenger, and Dawn of the Dead posters, probably left over from childhood but kept in immaculate condition. (The set was carefully conceived by designer Martin Flynn.) In front of him lay two cardboard boxes, one labeled "Take With," the other "Give Away." John Francis informs us that he's just accepted a job in San Francisco, and we've caught him in the middle of a mass purge. He's finally ready to grow up. Or not. As soon as his best friend John Alex (Sahai) enters, Francis is yanked back to childhood — specifically, 1984, when the two of them were eight years old and just starting to get dispirited with G.I. Joe. ("The stupidestly stupid stupidest show," in John Alex's words.) John Francis tells their coming-of-age story in flashback form, chronicling John Alex's development through the lens of his D&D character, Spango Garnet Killer. Slideshow illustrations by Emily Hardin show the 22 iterations of Spango, who started out as a stick figure in John Alex's notebook and grew to be a hostile, potty-mouthed warrior. Thus, we get a pretty apt introduction to the world of Dungeons & Dragons, a role-playing game that's often described as "Let's play pretend, but with rules." Most of the characters in Of Dice and Men first appear via their D&D alter egos. 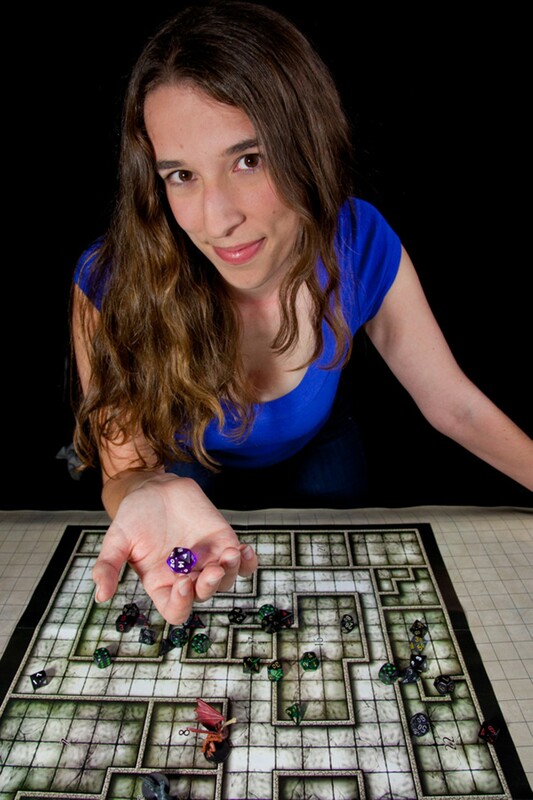 Tara (Maria Giere Marquis), the hot geek chick, is a medieval princess with visible cleavage. Linda (Linda-Ruth Cardozo) is a dwarf with a priapic fixation. Brandon (Stacz Sadowski) is a dumb barbarian — in real life, he's apathetic about D&D, and only plays at his wife's behest. Jason (Jonathan Brooks) is the awkwardly placed cool kid. ("Cool" being a relative term in the gaming world.) He's a knight, of course, and an odd foil to John Alex. The five characters meet regularly and play on a table littered with Mountain Dew sodas and store-bought cookies. These protracted scenes show McNary's facility as a writer, as well as his obvious familiarity with the gaming world. Everything from the dense language, to the comic repartee, to the characters' competitiveness is true of a real Dungeons & Dragons game, and the cast members have such intensity of focus that you really feel as though you're in the room with them. From an audience perspective, it seems difficult to sit on a couch for one long scene, stay in character, and keep the audience engaged. These actors do it with flair. In fact, the acting is the main selling point of this play, which says a lot since the script is also quite strong. A lot of individual character dynamics contribute to the overall drama of the play, and the cast members are burdened with making each of them believable: John Francis and Tara have fifteen years of sexual tension to overcome; Linda and Brandon have to create a real marriage; John Francis and John Alex have a close but slightly contentious friendship. The equally-fraught John Alex/Jason bromance is the only relationship that seems under-explored, which makes the play's climax and resolution a bit problematic. Nonetheless, it's bolstered by a series of revelations that keep things interesting. Perhaps the most impressive aspect of Of Dice and Men is the ease with which McNary turns a fantasy game into an all-inclusive metaphor — for romance, football, the Iraq War, brinksmanship, and the nature of cliques. Some of those analogies are trite, while others are pretty inspired. Either way, the play elucidates more than a few things about Dungeons & Dragons, and explains why so many people use it as an escape hatch, or a parallel universe.